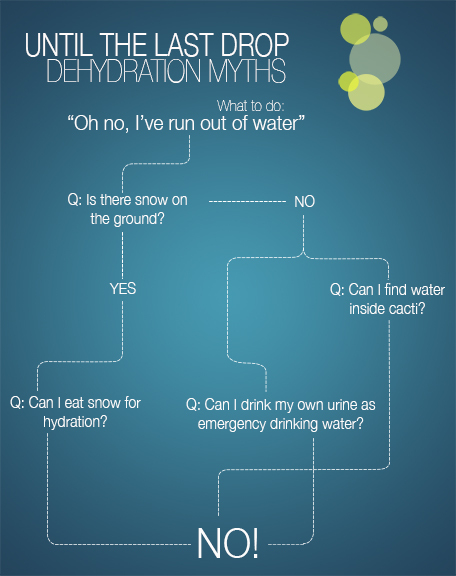 Dehydration has a number of urban myths surrounding it. Here’s a handy little infographic debunking a few of the most common myths. Eating snow can actually dehydrate and lower your body temperature, increasing the likelihood of hypothermia. Drinking urine is a common misconception. Urine develops bacteria the moment it comes in contact with oxygen, causing more harm for a body entering dehydration. While cacti occasionally contain excess water, reaching this water will likely take more energy than what it’s worth. Chances are, you will have cut through 5 or 6 cacti before reaching one with water, and at that point, you’ve used up more energy than what it’s worth.